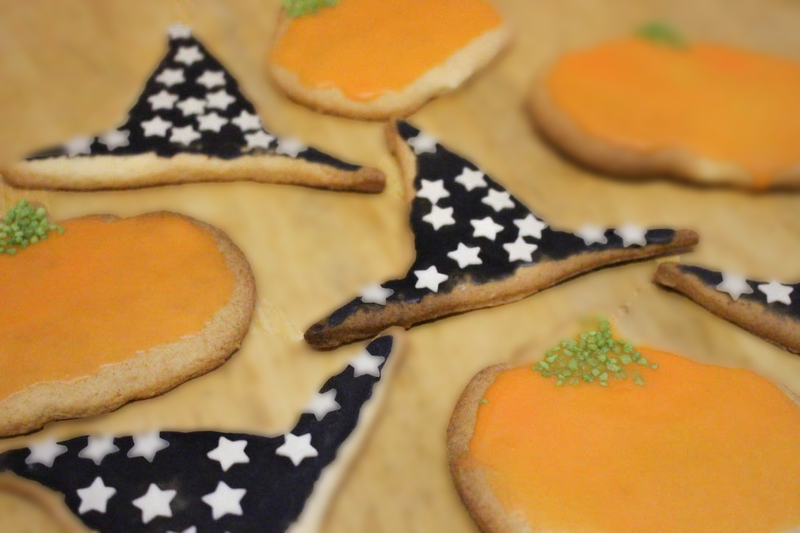 I absolutely love baking around Halloween time. I really enjoy getting creative to see what little creatures I can conjure up and using an array of festive colours such as blacks, oranges, yellows, greens and purples. Usually, I make one large bake, such as a cheesecake or cake, but this year I decided to go for three simple bitesized bakes that anyone can make. So, as there's going to be three recipes, I better stop rambling and get started. 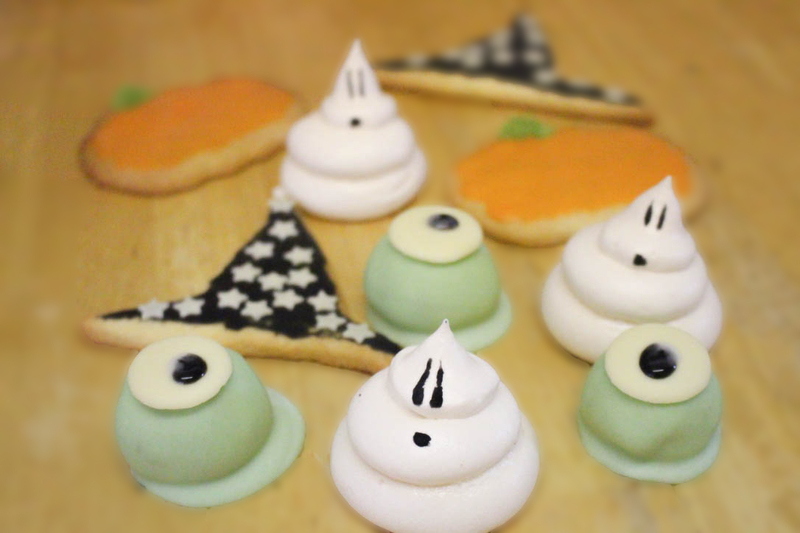 First up, we have the Meringue Ghosts. This recipe uses very little ingredients, some of which you'll likely already have in your cupboard and they take no time at all to make. 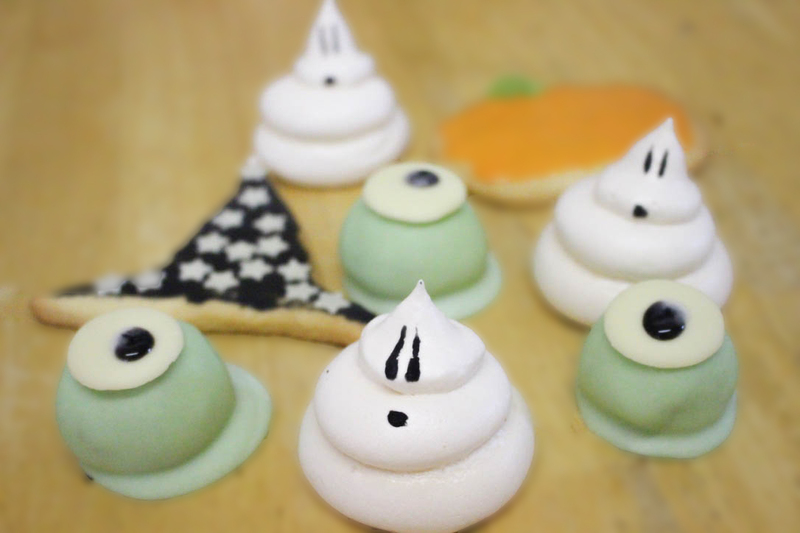 These little ghouls are definitely one of the easiest ways to get yourself into the Halloween spirit (geddit?) and would be a great addition to any Halloween party table. • Pre-heat the oven to 120C/100C Fan/Gas ½. Line two baking trays with greaseproof paper. • Put the egg whites in a spotlessly clean large bowl and beat with an electric whisk until stiff. • Add the sugar gradually, a tablespoonful at a time, whisking well after each spoonful. The meringue should be form stiff peaks and be glossy. • Place the mixture into a piping bag using a large round icing tip. Press the mixture directly down onto the paper, then lift up to create layers for your ghosts. • Place in the oven for 1/-1 ½ hours or until they are a creamy colour and can be easily lifted from the baking tray without sticking. • Turn the oven off, leaving the door ajar and leave the meringues until they are cold. • For the icing, mix the icing sugar, cold water and lemon juice together until combined. • Add a few drops of black food colouring to the mixture, combining well. • Using a toothpick, dip into the mixture and use fine strokes to add eyes and a mouth to the ghosts. Alternatively, you could melt milk chocolate and use this instead of the icing sugar. Another quick and easy recipe is for iced biscuits. You could make these at any time of the year using different cutters, but I found a set of Halloween cutters in TK Maxx and I couldn't resist picking them up. The set also included a bat and a cat shape, but I wanted to use the witches hat and pumpkin shapes because I'd be able to use more colours and sprinkles when it came to decorating them. • Pre-heat the oven to 190C/170C Fan/Gas 5. Lightly grease two baking trays. • Rub the butter into the flour with your fingertips until the mixture resembles fine breadcrumbs. Add the sugar, beaten egg, milk and vanilla extract, then mix to form a fairly stiff dough. • Roll out (thinly) onto a lightly floured surface and use your cutters to create whatever shapes you want. Place onto the baking trays. • Bake in the oven for 10-15 minutes until golden brown. Cool on a wire rack. • For the icing, mix the icing sugar, cold water and lemon juice together until combined to create a spreadable consistency. • Divide the icing into bowls (depending on how many colours you're using, I used 2 colours, so I needed 2 bowls) and add a drop of food colouring to each bowl, mixing well. • Spoon or pipe a small amount of icing onto each of the biscuits and spread out using the back of a spoon or knife. • Decorate the biscuits further by adding different shapes and decorations to the biscuits. I used white chocolate stars for the witches hat and green sugar crunch for the pumpkins. 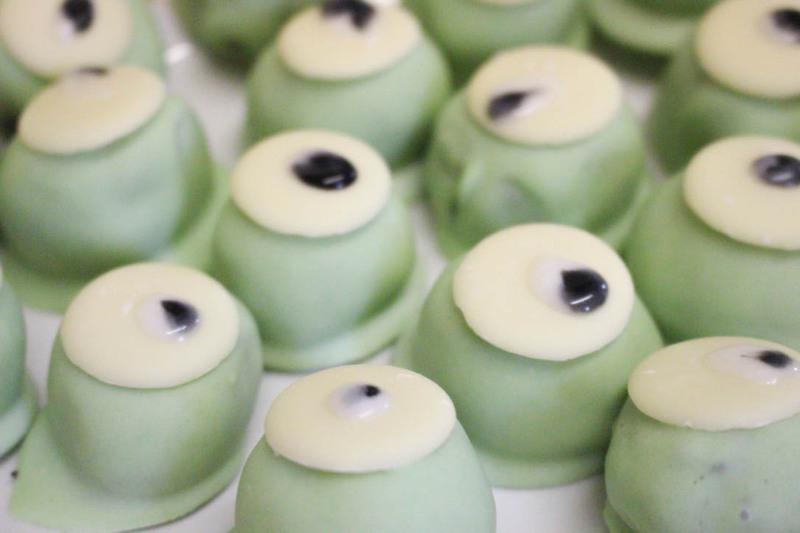 Finally, we have the Monster Oreo Truffles aka Mike Wazowski's. Similarly to the other recipes, this is one you could carry out with your eyes closed. Now, you could be really experimental and make your truffles into your own little creatures. I've seen bats, pumpkins, spiders, whatever you like really! Or, keep things simple by coating the Oreo balls in white chocolate, then then drizzling them with an orange and black drizzle by adding food colouring to white chocolate. • In a food processor, beat the Oreos until you have fine biscuit crumbs. • Add the Philadelphia and beat until the mixture is smooth. • Spoon a small amount of the mixture into the palm of your hand and roll into a neat ball. If mixture is too soft and difficult to work with, place in the fridge for 5-10 minutes to firm up. • Place the Oreo balls onto a lined baking tray and place in the fridge until firm. • While the Oreos balls are setting, melt the white chocolate, take it off the heat and gradually add the green food colouring until you reach your desired colour. Drain off the excess chocolate and place back onto the baking paper. • Place a white chocolate button on top of the truffle and allow it to set. • For the icing, mix the icing sugar and a tablespoon of cold water together until combined. Split the icing sugar between two bowls and add a drop of black food colouring to one bowl. • Finally, spoon a small amount of white icing onto the white chocolate button, followed by a small spoonful of black icing. So there we have it, three super simple treats for Halloween, which would be ideal for parties, cosy nights in, keeping little ones busy or if you just fancy something sweet. Would you make any of these sweet bitesized treats for Halloween? Let me know in the comments! Thank you so much Helen! You need to try them, they are so easy to make and I'm sure you'd love them! Thank you so much Marina! I hope you give them a go and love them as much as I do! Thank you so much Ana! They really would! Ohhh the ghosts are so cute! I might try to make them too! Thank you Heidi, I hope you do! I love the look of those meringues. I've actually never made them before as I've been told they can go wrong very easily haha. Thank you Linda! Meringues couldn't be any easier to make! Thank you Hannah, I hope you do! how cute are these?!?! definitely saving this post! Thank you Yana, I hope you give some of them a go! 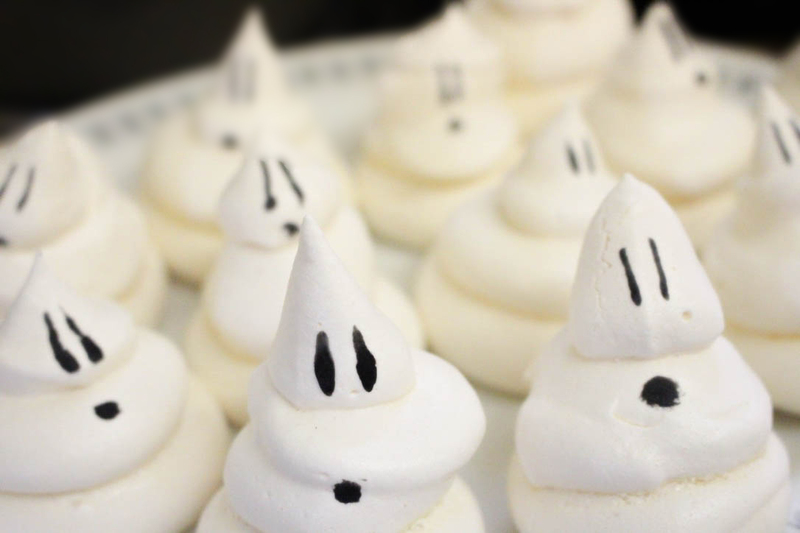 those meringues are SO adorable! my bf just learned how to make meringues haha, he piped them way too big :p the witchy hats are so cute too, love the stars on them! Thank you Becky! The bigger, the better! These look so cute, adorable and delicious! I definitely have to try the recipe!